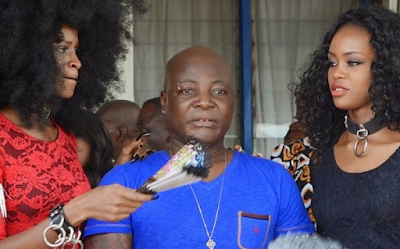 Charly Boy, veteran Nigerian entertainer, says he speaks with the dead through the help of his “virgins”. The singer popularly called Area Fada, says the two ladies who often accompany him to public functions, decipher the message of the dead. “My virgins help me communicate with all my dearly departed. They can translate the message of the dead”, he said. Charly Boy also noted that his personality is four-fold and that he would keep reinventing himself because he’s a “student of life”. “Do you feel like you transform, going from one element of your character to another one? There are four personalities that dwell in this body. Charles Emeka Oputa, the guy you’re having this conversation with. “The phenomenon you know as CharlyBoy, Linda my feminine alter ego and Odudubariba the spiritual warrior. “I keep reinventing myself as I keep circumventing, even though I have taken a beating from foes, the nigerian army, the police ect ect I have kept on ticking, because my words and ways have inspired millions of youths to be themselves to never allow anybody kill their dreams. Because of me, many Naija youths never gave up on themselves or their dream. “I have been teaching them, how to keep it real. And I have shown them that they can’t afford to compromise their dream bcos some idiot don’t get it. Yes I will for ever keep transforming because am a student of life.